The chocolatiers at Ethel M have created an unparalleled collection of truffles with creamy ganache centers, a velvety texture and delectable taste. 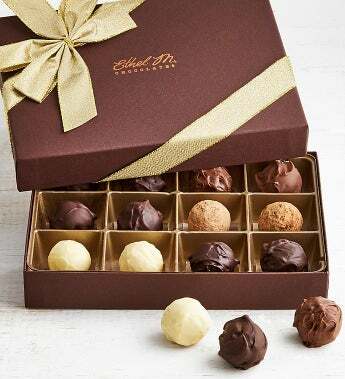 These fine truffles, elegantly presented in this signature collection, invite you on a journey. Experience Espresso, Honey, Cinnamon, Vanilla, Milk Chocolate and Dark Chocolate. Each bite begins with a firm, premium outer shell of chocolate, followed by a silky, creamy ganache center that is sure to delight. Prepare your palate. The chocolatiers at Ethel M have created an unparalleled collection of truffles with creamy ganache centers, a velvety texture and delectable taste. These fine truffles, elegantly presented in this signature collection, invite you on a journey. Experience Espresso, Honey, Cinnamon, Vanilla, Milk Chocolate and Dark Chocolate. Each bite begins wiThe chocolatiers at Ethel M have created an unparalleled collection of truffles with creamy ganache centers, a velvety texture and delectable taste. These fine truffles, elegantly presented in this signature collection, invite you on a journey. Experience Espresso, Honey, Cinnamon, Vanilla, Milk Chocolate and Dark Chocolate. Each bite begins with a firm, premium outer shell of chocolate, followed by a silky, creamy ganache center that is sure to delight. Prepare your palate.